Susan Clark is a writer and facilitator focusing on community sustainability and citizen participation. Her democratic activism has earned her the Vermont Secretary of State’s Enduring Democracy Award. 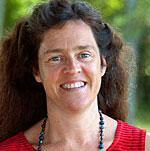 She served as coordinator of the University of Vermont’s Environmental Programs In Communities project. She chairs a committee in Vermont that encourages citizen involvement, and serves as town-meeting moderator. She is the co-author of All Those In Favor and Slow Democracy: Rediscovering Community, Bringing Decision Making Back Home.